It was bound to happen. In the aftermath of Osama bin Laden’s death, an incomprehensible number of debates have begun, concerning alleged violations of that cherished doctrine known as, “Political Correctness” or “PC” (to the amusement of Mac users). “This is one question on which there is little partisan division – at least six in ten Democrats, independents and Republicans all believe bin Laden is in hell,” adds Holland. In my book Pagans in the Promised Land, I use the theory of the human mind (cognitive theory) to explain the “cognitive unconscious” of the United States. Certain ingrained traditions of thought, both conscious and unconscious, have been used for generations by US government officials. Such thinking has resulted in the development of predominantly anti-Indian US federal Indian laws and policies. The result has been laws and policies that have proven detrimental to Indian nations and peoples. In the reported stories of Osama bin Laden being killed by US military forces, Bin Laden was codenamed “Geronimo”. According to a CBS News report, those who came up with that “inappropriate code name” apparently “thought of Bin Laden as a 21st-century equivalent” of Geronimo. In other words, the codename was based on an extension of the metaphor “Indians are enemies” to “Geronimo was a terrorist”, thus perpetuating the US tradition of treating Indian nations and peoples as enemies. I thought she was just a D-cup! 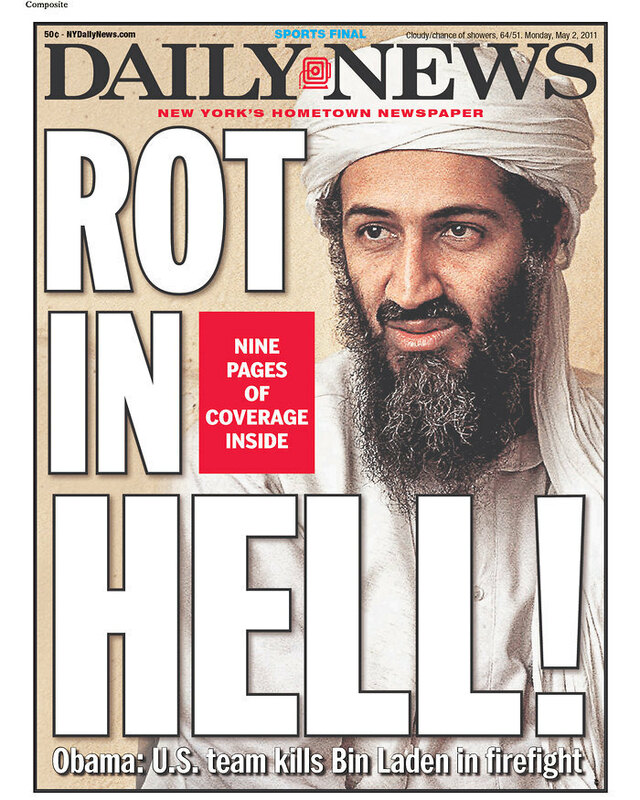 A more far-reaching Political Correctness debate has focused on the handling of bin Laden’s corpse and the suggested publication of the reportedly gruesome photos of his face. Since the days of the Bush Administration, great pains have been taken to demonstrate that America is not waging a war against Islam – we are at war with terrorists. Since we clarified that almost ten years ago, there should be nothing wrong with warning those who attempt to wage jihad against us that we will do everything in our power to make sure that terrorists are disqualified from becoming “martyrs” with an eternal harem of 72 virgins. Accordingly, I believe that immediately before a terrorist is executed, he should be baptized as a Christian to die as an “infidel” and suffer the damnation Allah bestows on such individuals. If bin Laden had been restrained and baptized just before he was shot, Islamic funeral tradition would have become irrelevant. Baptizing condemned terrorists would also serve as an effective deterrent to aspiring jihadists. Such a practice should not be offensive to legitimate Muslims, because there are many serious, respected Islamic authorities, who have repeatedly emphasized that terrorism is abhorrent to the Islamic faith. What better way to distance the Islamic religion from such deviates, than to disconnect them from Islam just before they are dispatched to the hereafter? Although some PC purists have objected to the execution of bin Laden, they constitute a fringe minority among even the most orthodox devotees of Political Correctness. Any attempt to transition bin Laden from waterbed to waterboard would have been logistically impossible, serving no valid purpose. As for the question of whether to publish the bin Laden photos, it is important to be mindful of recent reports that the Taliban has demanded release of the photos as proof that Osama is dead. It is generally a good idea to do the opposite of what the Taliban demands. Accordingly, the photos should be suppressed. While much of the hostility toward Obama’s domestic policy might be seen in partisan terms, distrust of the Fed completely transcends typical ideological or partisan lines. While all Congressional Republicans support Ron Paul’s bill to audit the Fed, so do more than a hundred Democrats, demonstrating the impact of the wide public outrage over the Washington-Wall Street shenanigans since the financial downturn. The Federal Reserve, a centerpiece in the bipartisan establishment, an essential component in both war finance and economic management, is now the least trusted government agency. More than two thirds of Americans do not believe the Fed is doing a good job. Two years ago, virtually no one even talked about the Fed; it was an obscure institution assumed to be necessary, wise and uninteresting. Anyone who brought it up was accused of being outside the sphere of respectable opinion. Now its champions are on the defensive, and they are desperately scrambling to restore public awe for the central bank behind the curtain. But the opposition to Obama’s economic policies, both on the right and on the anti-corporate left who view his ties to the banking industry with suspicion, along with a growing disappointment on the left as it concerns civil liberties and war, may eventually constrain Obama. The mistrust of the Fed, discussed by Mr. Gregory, was based on a Gallup Poll, also conducted during July, which revealed that the Federal Reserve is now “the least trusted” of all government-related entities. From its founding in 1913, the Fed has existed as an island of almost total independence — setting interest rates, managing inflation and regulating banks according to the will of its Chairman and seven-member Board of Directors. Of course, this ongoing shroud of secrecy ignores the fact that the Fed — as it exists today — is a completely different animal than it was even two years ago. By this measure, Bernanke’s performance is very poor. He has refused to provide the public, or even the relevant congressional committees, with information on the trillions of dollars in loans that were made through the Fed’s special lending facilities. While anyone can go to the Treasury’s website and see how much each bank received through Tarp and under what terms, Bernanke refuses to share any information on the loans that banks and other institutions received from the Fed. Where we do have information, it is not encouraging. At the peak of the financial crisis in October, Goldman Sachs converted itself from an investment bank into a bank holding company, in part so that it could tap an FDIC loan guarantee programme. Remarkably, Bernanke allowed Goldman to continue to act as an investment bank, taking highly speculative positions even after it had borrowed $28bn with the FDIC’s guarantee. This legislation wouldn’t undermine the Fed’s independence, and it wouldn’t put Congress in charge of monetary policy. An audit is simply an examination of records or financial accounts to check their accuracy. We must not equate “independence” with secrecy. No matter how intelligent or well-intentioned the Fed chairman and his staff may be, it isn’t appropriate to give a handful of people the power to lend an unlimited supply of money to anyone it wants without sufficient oversight. The Federal Reserve’s unprecedented intervention into the U.S. economy has inflamed more Americans than almost any other issue in recent memory. The most conservative estimates place the potential cost of the Federal Reserve’s bailouts and guarantees at about $9 trillion. That is equivalent to more than 60 percent of the U.S.economy, all undertaken by one organization, and almost all of those transactions are exempt from congressional oversight and public scrutiny. The Fed and its apologists are using bogeymen to deflect criticism. If the Fed were audited, they argue, monetary policy would be compromised as Congress tries to direct the Fed’s actions, and the Fed’s record of economic stability and low inflation would come to an end. Nothing could be further from the truth. The Fed’s mismanagement created the Great Depression, the stagflation of the 1970s, and now our current economic crisis. Over the nearly100 years of the Fed’s existence, the dollar has lost nearly 95 percent of its purchasing power. A “mild” rate of inflation of 2 percent per year means that a baby born today will see the dollar’s purchasing power erode by a further 75 percent over his lifetime. If this boondoggle is the Fed’s definition of stability and sound management of the dollar, I would hate to see what instability looks like. Yet that is exactly what we face today and in the near future with a federal government and a Federal Reserve working hand in hand to bail out favored Wall Street firms with sums of money that have quickly reached absurd proportions. The fact that a single entity, the Federal Reserve, has dominated monetary policy for so long has been detrimental to the economy. As long as we try to keep up the fictions that the Federal Reserve works to benefit the American people, that attempting to fix interest rates will not distort the economy, and that the Fed can end a recession by injecting liquidity, we will never free ourselves from the boom and bust of the business cycle. A necessary first step to restoring economic stability in this country is to audit the Fed, to find out the multitude of sectors in which it has involved itself, and, once the audit has been completed, to analyze the results and determine how the Fed should be reined in. Paul is just as plausible a candidate to run for the Republican nomination as are Mitt Romney, Sarah Palin, or Mike Huckabee who were tested in polls this month. Like them, Paul’s run for the White House (twice) before and has said he isn’t opposed to doing it again, albeit he said it’s “unlikely.” What’s more likely, based on the circumstantial evidence, is that the Republican voters would receive Paul better than they did last year. Feature him in polls from now on and we can test this hypothesis. As President Obama continues to alienate the liberal base of the Democratic Party, Ron Paul might be just the person the Republicans would want to nominate in 2012. He’ll be 77 years old at that point — just in time for a single term.